Franz Hals - Inspiration for Sargent's Madame X? 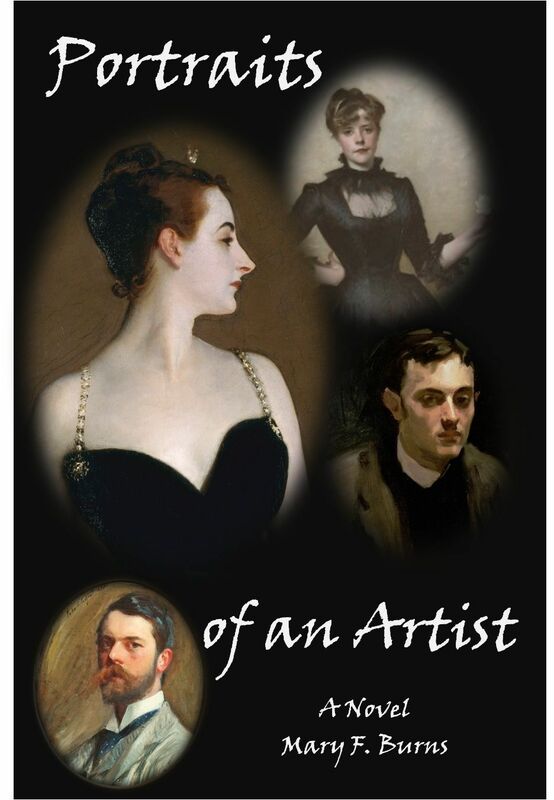 For several months in 1883, John Singer Sargent worked feverishly to capture the image of Virginie Amelie Gautreau--soon to be known as the "infamous" Madame X--both at his studio in Paris, and later, at the summer chateau of the Gautreau family in the west of France in St.-Malo . 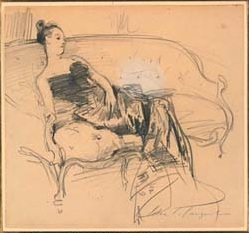 Sargent had painted and sketched Mme. 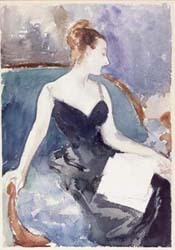 Gautreau in oils, watercolors, pastels and charcoal--sitting, standing, lying down, walking in the garden--and was unable to fix on the exact right pose and setting for what he desired to be a magnificent portrait. Here are some of his attempts. 1666). Hals was known for having introduced a more familiar, intimate style of portraiture, especially in group portraits. 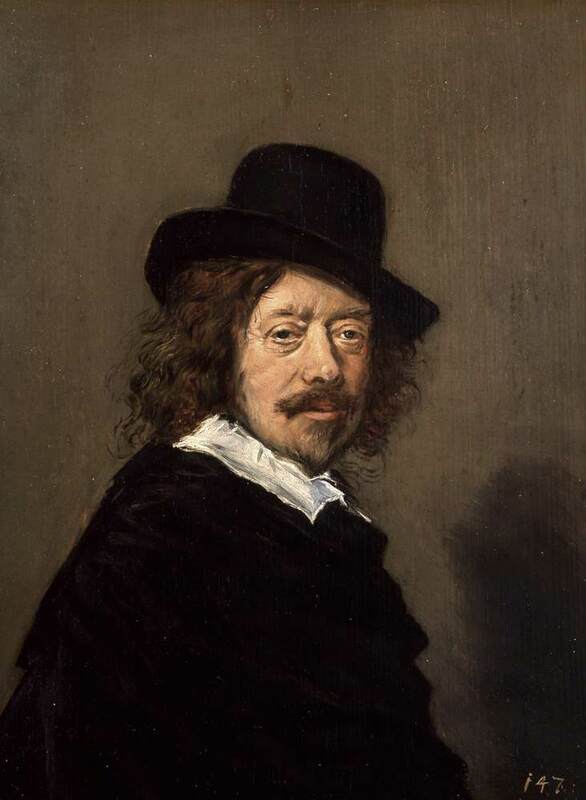 Here on the left is a self-portrait done in his classic style, with loose brushwork, a plain background, and the sitter's shadow on the wall. 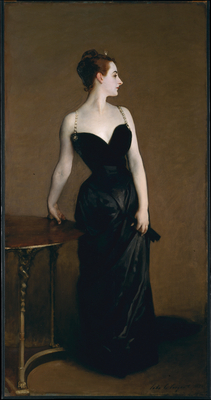 As I researched Sargent's life and travels, I took a close look at Hals' paintings, and decided that there was sufficient reason to consider Hals' style as an inspiration for the final portrait of Madame X. 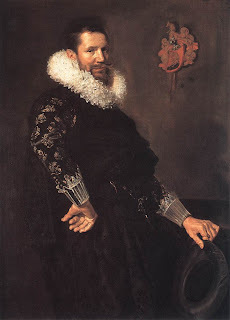 Not only is the plain brown background a striking effect, along with the shadow, but the odd twist of a sitter's body can often be seen in Hals' larger portraits. He frequently had his subjects touching a chair or table that was half in and half out of the frame. 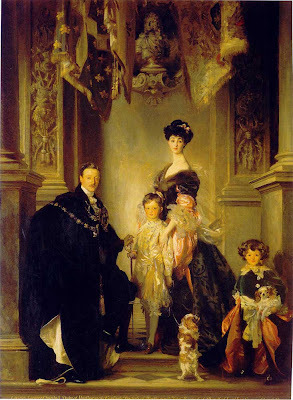 There is a subtlety and a richness in the deep blacks and browns, especially as contrasted with white collars and ruffs, and rosy skin. The most decided difference between any of Hals' subjects and the Madame X portrait is that Hals' people all look forward at the viewer, frank, open, honest, amused, interested. Not Madame X, however. She disdains to look the viewer in the eye. She is an inaccessible Beauty. Her skin is not rosy (except for her ear, where her pale powder makeup didn't reach, apparently--that rosy, natural-colored ear was quite a scandal). The alabaster color of her arms and shoulders, her neck and face, are the "white ruff" counterpart of Hals' paintings. Not even a necklace relieves the pallor of her skin, although the straps of her dress are diamonds in gold chain links. The original painting had her right shoulder strap falling down on her right arm--scandal again. She is dressed (or "barely dressed") all in black -- and as the ladies of Paris instantly realized, she's not wearing a corset, or any proper undergarments. It is a fact that shortly after Sargent returned from his trip to Haarlem, he fixed upon this pose, these colors, this dress as the component parts of his masterpiece, so I think I'm in a pretty safe place thinking Hals was the inspiration. 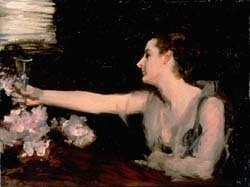 After the uproar and outrage of its showing at the 1884 Salon, Sargent kept the painting in his studio and did not lend it out for exhibition until once in 1911 in Italy, and then finally at the 1915 San Francisco Panama-Pacific International Exhibition. After that, rather than ship it back to England, he sold it to the New York Metropolitan Museum of Art, where it hangs in splendor today in the newly built wing of American Art. Sargent did indeed paint an enormous portrait of the Duke's family (above)--not at all his best effort, imho--but he was "told" that it was to complement an earlier painting of the 4th Duke and his family by Sir Joshua Reynolds. 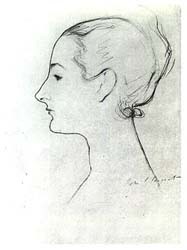 Here is Reynolds' portrait, as well as a sketch of Duchess Consuelo by Sargent. Hmm, maybe there was something to that fictional affair after all?